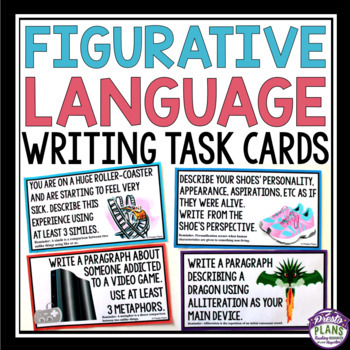 FIGURATIVE LANGUAGE TASK CARDS FOR WRITING: Help your student use metaphor, simile, hyperbole, personification, and alliteration in their writing with these figurative language task cards! 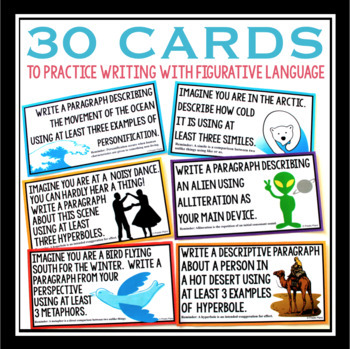 This resource includes 30 task cards for students to practice including figurative language into their writing to enhance description. Task cards can be useful for independent, small group, or whole class content practice. These task cards in particular are used for students to practice using figurative language in creative writing. Also included is a list of ways that you can use these task cards in your class (independent, small group, and whole class). Not only can students use the card as a reference tool for figurative devices definitions, but also as a fun and engaging writing prompt. ♥ Wonderful resource- highly recommend! My students enjoyed completing these tasks. ♥ Wow fantastic! This is one of many products of yours that I purchased. Looking forward to using them to spark some life in class. ♥ My 7th & 8th grade students loved this! The directions were clear on every card and they loved writing about each and every one they looked at.